If people have a stereotype about what vegetarians eat, veggie burgers, along with salads and tofu, are probably at the top of the list. I don’t think they’re entirely wrong either. If you go to a restaurant and there’s one vegetarian item on the menu, it’s very likely that the item is a veggie burger. And those veggie burgers vary in quality—sometimes you get a gross frozen processed soy burger that’s full of artificial flavors to make it taste like real meat, while other times you get a homemade patty full of veggies and grains and other good stuff. Those homemade patties are the ones I get excited about. Veggie burgers can be the most boring things we eat as vegetarians, but they can also be the most inventive too. This, my friends, is the paradox of the veggie burger. 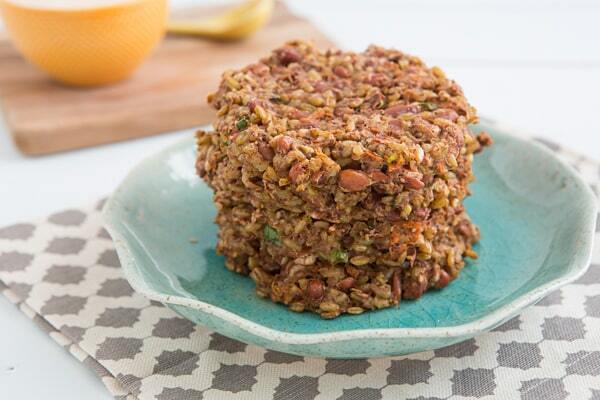 I hope that these Freekeh Bean Burgers fall into the inventive category. I kind of think they do. Because: FREEKEH! You don’t see that in veggie burgers everyday, do you? No! When I did the whole summer of veggie burgers thing, I wanted to make these too, but I had more ideas than I could fit in, so they had to wait. And here they are! In addition to freekeh, these have pinto beans, shredded carrots, and green onions in them, then they’re seasoned with a liberal amount of za’atar (a Middle Eastern spice blend). You can usually find za’atar at specialty grocers and spice shops, but you can make your own za’atar too. Veggie burgers are about the whole package, though—it’s not just about the patty, but what you put on it and how all those flavors come together. So to top these Freekeh Bean Burgers, I made a batch of harissa onions and whipped up some Smoky Garlic Aioli, which has become a staple in our fridge since I made it to serve with Cauliflower-Carrot Fritters. The onions are sweet and spicy, but the aioli tempers the spiciness so it’s not like WHOA OW SPICY HOT. Each bite has the perfect balance of heat and spices and textures. This post was originally published on December 2, 2013. 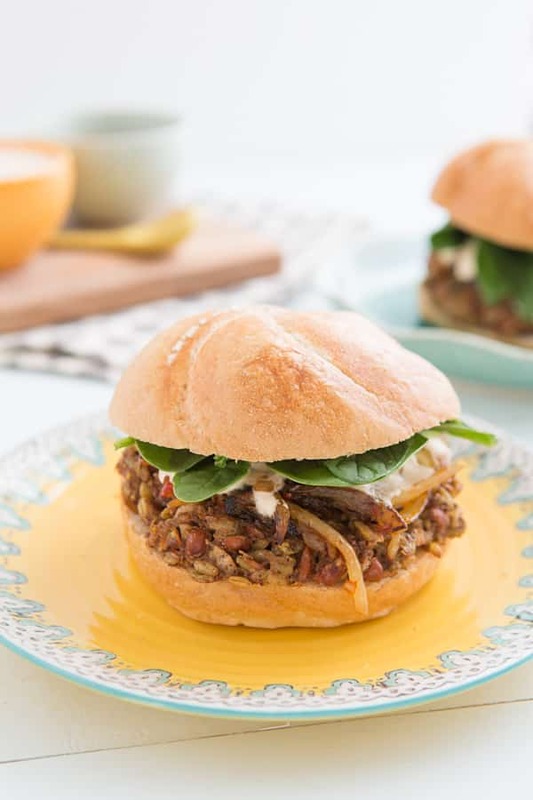 Middle Eastern-inspired veggie burgers made with cracked freekeh and pinto beans. Place the beans in a large bowl and use a wooden spoon or potato masher to mash them slightly—they shouldn’t be completely mashed, but there should be very few left intact when you’re finished. Stir in the freekeh, garlic, carrot, and green onions. Season with the za’atar 1 teaspoon at a time, tasting to get the right amount. (Since za’atar mixtures can vary, it’s hard to give an exact number, but I ended up using a full tablespoon.) Stir in the cumin and salt and pepper to taste, then fold in the egg. Form the burger mixture into 4 large patties (for large hamburger buns) or 6 small patties and place them on a parchment paper-lined baking sheet, shaping them on the sheet to make sure they’re round and well-formed. Spray the tops with an oil mister (or brush them with a small amount of olive oil) and bake for about 25 minutes, or until lightly browned and slightly crispy on the edges. While the burgers are in the oven, heat the olive oil in a large skillet over medium heat. Add the onion and a pinch of salt; cook until browned, 8-10 minutes. Stir in the harissa, starting with 1 teaspoon (or a half teaspoon if you’re not a fan of spicy food) and adding more to taste. To assemble the burgers, place each patty on a bun and top them with onions, aioli, and spinach leaves. Yum! This is an awesome vegetarian burger recipe that I’m sure many people would enjoy. Thanks for sharing!